Gluten-Free Fall Fun with Snyder's Chips! Ahhh, fall. The season of tailgating, pumpkin picking and Halloween soirees. It's funny, but this season is one I attribute to good food. Maybe it's all the pumpkin-spiced items, the meatier meals on chilly nights or the food-laden holidays of Halloween and Thanksgiving. But when autumn arrives, I'm ready to chow down! More and more people in my life struggle with food allergies. I'm quite aware of it as a parent of school-aged girls. I'm a homeroom parent for Chica's class, and each year, there are an array of allergies that we need to be sensitive too. Despite the bad press food allergies have received in the past few months, I'm fully supportive of accommodating those with allergies. If it were my kid or my husband that struggled, I'd hope they would be extended the same care. So, I'm always looking for good allergy-friendly food to keep on hand at home. You never know who is going to pop in, and it's nice to be able to offer food to anyone who stops by. I keep an eye out for specifically peanut-free options as well as gluten-free items. This year I'm also working on offering only allergy-friendly items on Halloween. Partly because I want everyone to feel safe and enjoy the holidays. Partly because I, personally, don't need that much candy in my house! That's why I'm digging the awesome variety of chips from Snyders of Berlin®. Not only is Snyders local to us PA natives, but their chips are delicious AND gluten-free. They recently had a design make-over on their bags, and the new packaging pays homage to Berlin, Pennsylvania with eleven flavors each featuring a different landscape or location. The Snyder of Berlin® potato chips are available in Original, Bar-B-Q, Honey Bar-B-Q, Sweet and Sassy Bar-B-Q, No Salt, Vlasic Dill Pickle, Salt & Vinegar, Cheddar, Sour Cream, Rippled and Wavy. 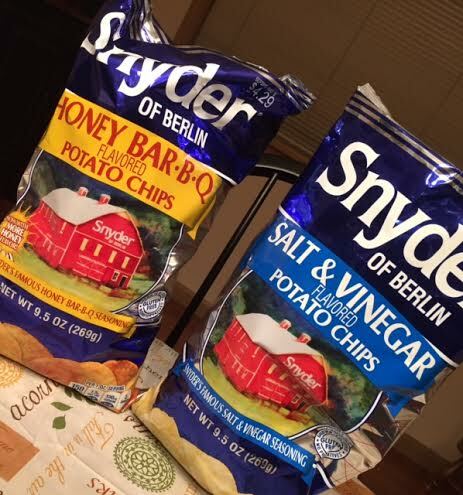 A majority of Snyder of Berlin chips are Gluten-Free; always check the bag for Gluten-Free claims. For more information and to see the full line of Snyder of Berlin® products, visit www.snyderofberlin.com. Disclosure: I was give product samples to conduct this review. As always, all opinions are my own.